The enhance is something of an interesting product in that I can’t imagine how many people will actually need it, however, it’s position on the market is easy to justify. People need their laptops cooled down especially when gaming. The gaming laptop is on the rise so peripherals like this are becoming in demand. 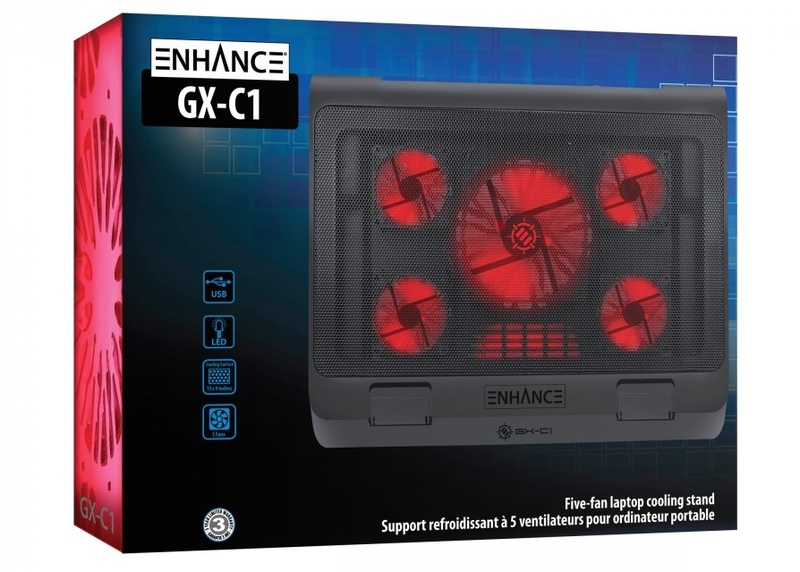 There are a lot of options on the market and some of which are better value than others, however, the Enhance really has something a lot of the competitors cannot brag and that’s the number of fans. For £20 you’re getting one huge fan and four baby brothers. When working all together these fans produce a vast amount of airflow to cool your laptop down. There are a couple of extra features added to this that some of its competitors do not have. There is USB passthrough, meaning this doesn’t really occupy a USB port on your laptop. The Enhance allows you to plug a device into the Enhance and it will work on the laptop. A rotary dial allowing you to control the speed of the fans and indeed the brightness of the LEDs, 2 rubber braces at the edge of the surface that prevent your laptop from sliding off in the event that your laptop’s rubber feet may not be enough. On the underside are retractable legs, these legs have three different options the highest of which raises the unit around 3 inches from the desk, an entirely second pair that raises the unit an inch and a half and some pads for no height adjustment. The unit itself is almost 2 inches thick at the widest part so the raise is quite considerable when you have the longer legs in action. However, this cooling comes at an expense when plugging this into your laptop as it will drain the battery quite quickly. I have noticed that after being plugged in for half an hour on my laptop the battery dropped by almost a quarter. I kept the fans at full speed the entire time just to get an idea of the (pun intended) blow to the battery. A better solution maybe to hook the fan up to are portable battery or power bank. One negative I will say is it’s a very difficult one for any company to try and work around is portability. Obviously, this works off your laptop’s battery, however, the unit itself has to be the size of a laptop to cover the area of the laptop. This makes the Enhance a little cumbersome to take with you as it will occupy the same amount of space on a laptop bag as a laptop. There are plenty of alternatives on the market some quite a bit cheaper however none of them offer as many fans as this in such a simple design. Being able to control the speed all five fans mean the battery won’t take at big a hit as all five fans give more coverage than two large fans running twice as fast. This certainly isn’t the highest quality but then again the price tag isn’t particularly high either. Overall, It does what it says on the tin and it keeps your laptop cool on the go whilst looking kinda badass. You can find the blue variant on Amazon.